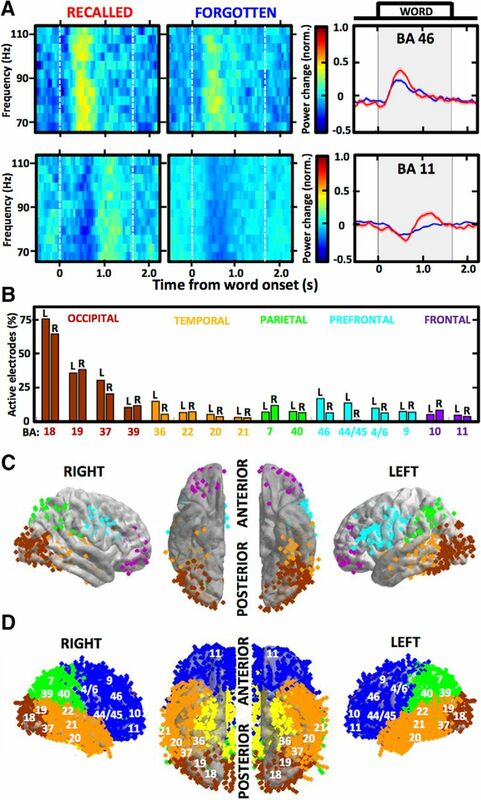 Brain activity induced by word presentation was analyzed in this study, and comprised 1600 ms of word display on the screen and 700-ms blank interval before and after each word (total of 3000-ms epoch). 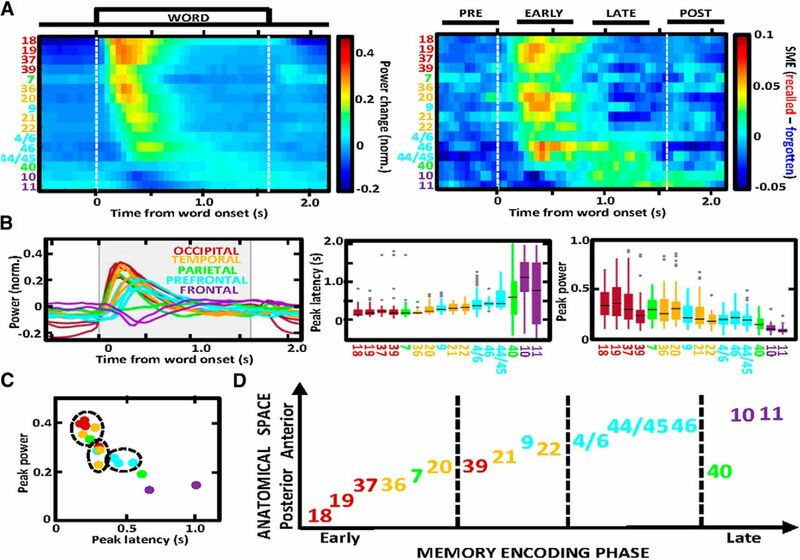 Hence, one complete session yielded electrophysiological signal from 300 word encoding epochs (25 lists × 12 words). 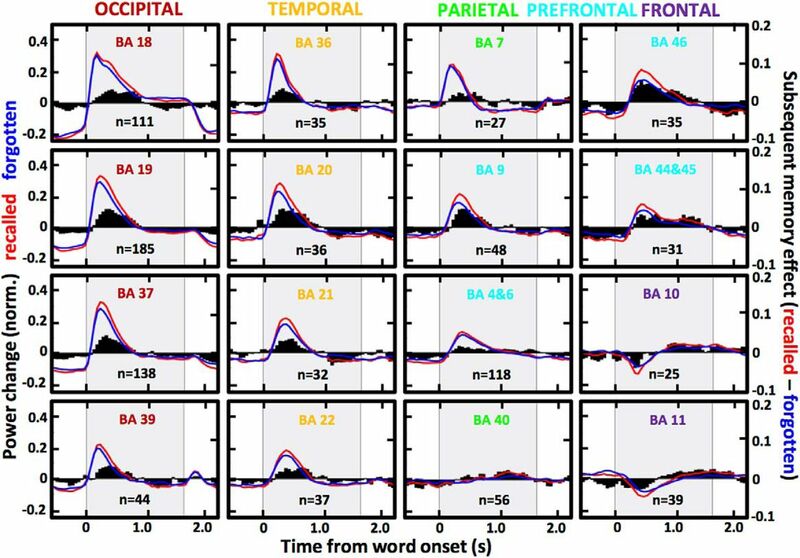 The raw signal of each epoch was spectrally decomposed into 50-ms time bins using multi-taper Fast Fourier Transform [Chronux toolbox, RRID:SCR_005547 (Bokil et al., 2010); taper parameters: 4-Hz bandwidth, 250-ms timewidth, 1 taper]. To estimate power in the high γ (65–115 Hz) frequency band, the epoch signal was bandpass filtered between 65 and 115 Hz cutoff frequencies (Bartlett–Hanning, 1000 order) before the spectral decomposition to reduce any possible influence of lower frequencies on the power estimate. The cutoff frequencies for the high γ band were chosen to minimize contamination of the 60-Hz line noise and its first harmonic at 120 Hz. The decomposed spectral power values in a given frequency band were log and z score transformed in each frequency bin to account for the power law effect and obtain values that can be compared in the same normative scale (SDs above or below the mean) across sessions and subjects. This z score normalization was calculated for each datapoint “i” within any one signal epoch of word presentation according to the following formula: where X is the raw signal, μ is the mean, and σ is the SD, assuming normal distribution of the sample population. This method is more appropriate than baseline or grand average normalization for signals with non-stationary baseline periods with negative amplitude changes. 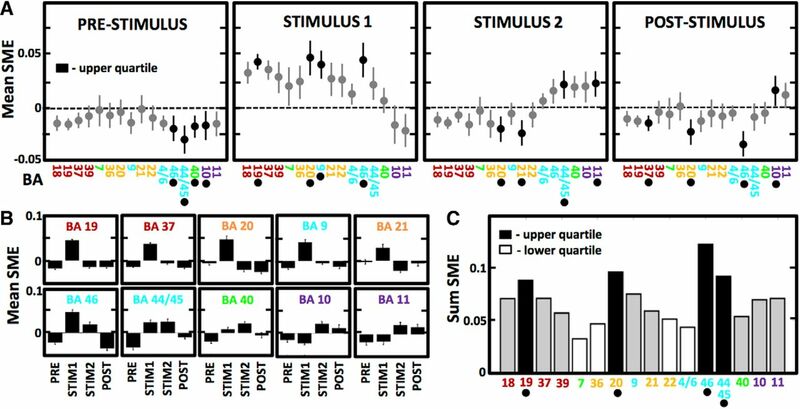 Normalization within each epoch separately was used to avoid influence of signal non-stationarities across time of a single session or across consecutive sessions. This method, however, is prone to augmentation of any negative or positive power changes from the average estimated within a single epoch. There are alternative options to avoid this potential confound, including normalization across all epochs in a session or normalization to the pre-stimulus baseline. Copyright © 2019 Kucewicz et al.